Bentley Continental GT driven | What Car? Just like HP sauce and fish and chips, things don't come much more British than a Bentley, even if the latest Continental GT is built almost entirely from Volkswagen group parts. 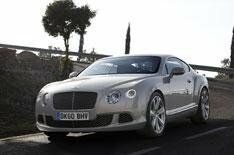 Well, dry your eyes Anglophiles, because the Continental GT happens to be one of the finest coupes money can buy. A 576bhp 6.0-litre twin-turbo W12 engine provides the driving force and all that power is pumped through an six-speed automatic gearbox and down to the road via four-wheel drive, and wide tyres on 20-inch alloy wheels. Hardly surprising then, that despite its prodigious 2.3-tonne weight, the Continental is one seriously quick car. Sink the huge accelerator pedal into the thick pile carpet and that famous grille rises in unison with the smooth, instantaneous, and vast force you've just unleashed. The Continental GT takes just 4.6secs to go from rest to 60mph, a fraction over 10secs to reach 100mph and carries on to a top speed just shy of 200mph. It's just as well that the active suspension and wide axles mean straight-line stability is unwavering. Don't go thinking that the Continental was conceived just to devour motorway miles, however. Quite the reverse. Show it a series of bends and the combination of grip, sweetly weighted steering and minimal body roll enable the GT to change direction smoothly and accurately. Given that it's a Bentley, you'd be appalled if it wasn't library quiet: you won't be disappointed. The new car is 16% quieter than the model it replaces. Inevitably, those big tyres do generate some road noise over grainier surfaces, but that's the only tiny fly in the ointment. The engine is running at just above tickover at motorway speeds, so there's almost no mechanical row from under the bonnet, while the triple laminated acoustic glass blots out wind noise completely effectively. Your passengers will have no problem catching forty winks as you enjoy the vast reserves of performance. The interior of the Continental GT is much more up to date than the old car's; it has a much more bespoke look and feel. There are better-quality materials all around, super-supportive leather seats, and the latest infotainment system, all of which mean the interior now has the quality and feel to match the substantial pricetag of 135,760.